When 26-year old Andrew Alexander opened his first shoe store on Eighth Avenue in 1857, the Fifth Avenue mansion district was just beginning to inch north of 42nd Street. His business flourished and in 1896 he opened his own impressive building at the corner of Sixth Avenue and 19th Street—squarely in the center of the shopping district that would become known as the Ladies’ Mile. But as the turn of the century came and went, fashionable shopping, like fashionable living, followed a northward flow. 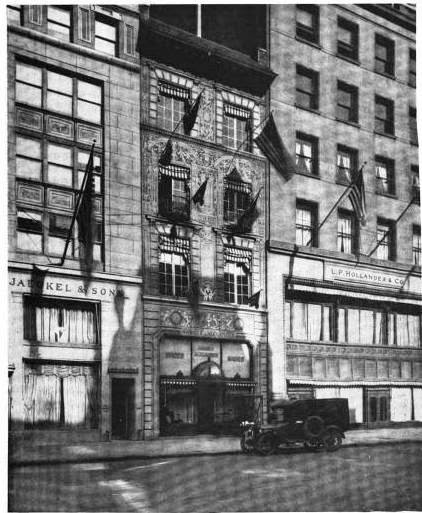 While Roland Macy would erect his massive department on 34th Street and Broadway; other retailers like Benjamin Altman, would boldly move onto Fifth Avenue—fueling the panic of millionaire homeowners. On April 2, 1906 Thomas W. Evans died in his brownstone home at No. 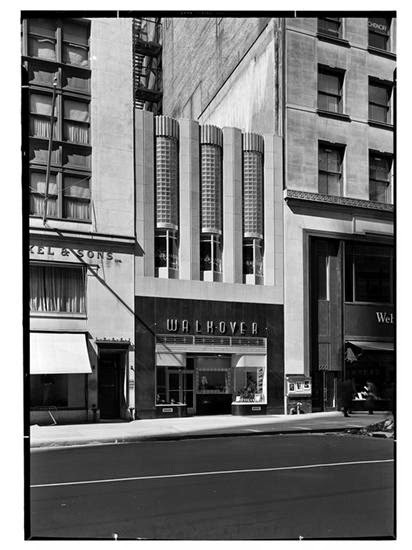 548 Fifth Avenue, the same year that Altman opened his white marble retail palazzo a few blocks to the south. The 87-year old was the founder and senior member of the dry goods firm Evans, Gardiner & Co. His funeral was held in the house on Wednesday morning, April 4. Evans’s widow, Louise, lived only a few months longer. On Friday, December 21, she too died in the house. Real estate operators were impatiently waiting in the wings. Although Andrew Alexander had died at the age of 72 in 1903; his will requested that his wife and daughters “continue his business.” They had done so admirably and now the estate eyed the old converted brownstone as a tempting site for expansion. Having made the winning bid of $415,000, the Alexander shoe firm now laid plans for its new Fifth Avenue store. The company went to the top of the heap in choosing its architects. Carrere & Hastings had just completed the masterful New York Public Library three blocks to the south. They would now focus on a smaller commission—the remodeling of the old Evans house. The description of a brick wall “covered with stucco” fell far short of what was to come. Carrere & Hastings turned to a 16th century Italian technique known as sgraffito. Similar to that used for painting of frescoes, the process involved the application of layers of color-tinted plaster to a moistened surface. Significant during the Italian Renaissance, sgraffito was about to make its appearance on a Fifth Avenue shoe store. The renovation was completed before year’s end. The upper three floors closely resembled an Italian townhouse with the intricate two-toned sgraffito ornamentation, the cast iron balconies at the third floor, and the deeply-overhanging tiled roof. The two-story shop front was framed in colored marble against a rusticated background. 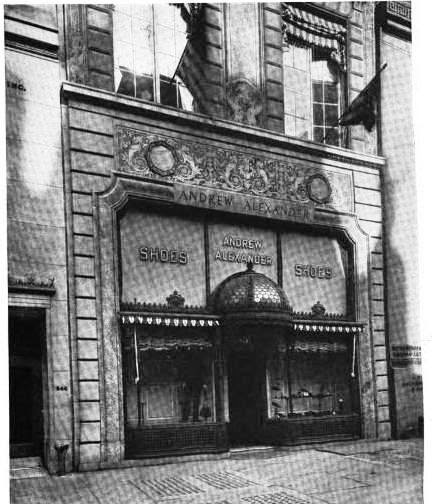 A handsome half-domed canopy over the entrance was composed of fish-scale glass sections, and the name of the store appeared in bronze letters below an intricate frieze. Andrew Alexander opened its uptown store in December 1911. Charles Price, writing in Arts & Decoration “regretted” that Carrere & Hastings had not shown the designs in that year’s Architectural League of New York’s annual exhibition. 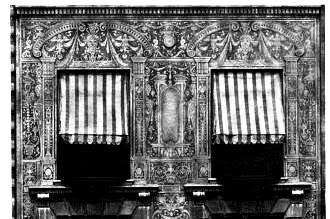 He called the work “the charming little shop with which they recently decorated Fifth Avenue, its façade treated with ‘sgraffito’ ornamentation.” Aymar Embury II called the building “excellent” in The Brickbuilder. 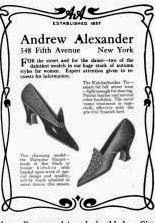 The high-end product Andrew Alexander offered to its wealthy customers is evidenced by the annual slipper sale prices in 1919. Boot and Shoe Recorder on January 11 noted “At the Fifth Avenue store the sale covered slippers at $4.90 a pair, and was described as follows: ‘Beaded slippers of satin, black and bronze kidskin, beautiful designs, and finest work. Also slippers at $5.85, $6.85, $7.85 and $8.75.” The war-time sale prices translate to over $100 for the least expensive. The elegant Andrew Alexander shoe store would remain here until the early 1920s. It was replaced by Sheridan’s, a high-end shop selling gowns and millinery. On September 28, 1928 four well-dressed women exited a taxicab and entered the store. Miss Paget, a saleswoman, greeted the women and took one of them to the mezzanine to look at coats. The others took seats near the door and waited. When the woman found nothing to her liking, she joined her friends and they climbed back into the taxi which had waited for them at the curb. It was later that someone noticed that the $1,200 mink coat from the display window had left with them. Like Sheridan’s, Edman & Bros. would not remain in the building overly long. In 1935 O. H. Gropper, leather goods manufacturer, leased the building. The former Alexander shoe store was now The Gropper Travel Outfit Store. The leather shop had barely opened before a tragedy occurred. Around 7:00 on January 18, 1935 foot patrolman James M. J. Killian and his partner, Walter B. Curtis, happened upon an armed robbery taking place in the store. A gun battle erupted during which 30-year old Killian was fatally shot in the temple. He had been on the force since September 27, 1929 and left a wife and two daughters, aged four and one-and-a-half. The public was outraged at the brutal killing and the details of the trials were followed in the newspapers for weeks. All four were eventually convicted of murder and sentenced to death in Sing Sing. By 1938 Carrere & Hastings’s wonderful Edwardian façade with its elaborate decoration had fallen from fashion. That year, on October 23, The Times reported that “The four-story building at 548 Fifth Avenue is being altered into a structure of two stories at an approximate cost of $15,000.” Somewhat ironically, it was another shoe firm that commissioned architect Eugene Schoen to transform the sgraffito decorated structure into a sleek Art Moderne building, as much sculpture as architecture. The Victorian brownstone, turned Italian Renaissance townhouse, turned Art Moderne retail store survived until 1958. A six-story bank building replaced both it and the corner building at No. 546. Today, in place of that structure is the 22-story mirror-glassed Safra National Bank Tower. Actually one of the few cases where I like the replacement building - the Walk-Over Shoe building, not what is currently there. The Moderne building was quite stylish and interesting. 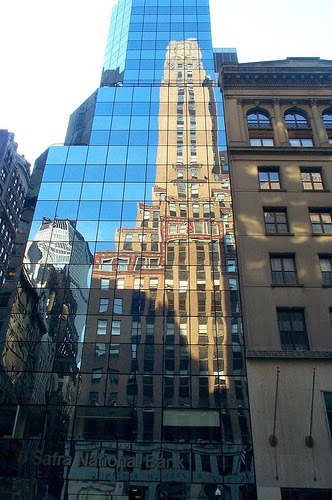 The mirror glass building there now is just so boring and cliche. I'm not a fan of mirror glass buildings. I totally agree. I would be very hard pressed to choose between the Carrere & Hastings building and the Schoen structure. You can have the glass one! Wow - this one has everything! Besides the architectural details the back story has great interest. A stolen mink coat, an unfortunate police shooting, and a mural named "Shoemaker's Dream" ! You couldn't make this stuff up and be credible. BTW, I received my pre-ordered copy of "Seeking New York: .." and absolutely LOVE it. Very nicely done. I can take it with me and enjoy a slice of old NYC whenever I have a few moments. So glad you made this happen, Tom!